Thus, the wheels began to turn on one of the best wedding surprises I’ve ever accompanied with my harp. Jack had everything mapped out. He planned a summer vacation with his girlfriend, along with his grown son and her grown daughters from previous marriages. On the morning of June 14th, he would propose to his girlfriend, they’d climb into a limousine, and jet off to Logan Shoals Vista Point, a gorgeous photo stop along the southeast shore of Lake Tahoe. Harp music will be wafting through the air as the minister greets the family upon their arrival. He’ll hand Shirley, the bride, a bouquet, and the wedding begins. Afterwards, they clink champagne glasses and enjoy cake, and then leave to make it to their lunch reservation at a lakeside restaurant. Jack scheduled this wedding day surprise as good or better than any professional wedding planner I knew. I went ahead with the plan, with Jack understanding that he bought live harp music for June 14th, whether his girlfriend consented to marry him or not. June 14th arrived. Did I fear that Jack’s proposal would be turned down and he’d never show up? Not at all. I sat out at Logan Shoals, waiting for the signal from Reverend Ron that the limo drove up, and then began playing. They arrived on time, a family dressed in t-shirts, shorts, and flip-flops—Not quite what you’d consider wedding attire. Reverend Ron handed Shirley, the bride, her bouquet. She stood there, in absolute amazement with happy tears, responding to her vows. Their adult children giggled through it all, because they weren’t in on the surprise, either. I signed the witness papers and left after their post-ceremony champagne toast. I am often asked about my very favorite wedding, and this one tops them all. No big production, just love. I believe that some of the most romantic experiences of all are sweetly planned surprises. “What’s the occasion?” I asked. How could I turn him down? Sure, it was last minute, but I only need a few hours’ notice to be ready to play. Bob gave me a short list of his wife’s favorite songs and instructed me to pick up an extra key from the hotel front desk to set up while he and his wife were out shopping. When they entered the room, I began with “Unchained Melody”. She burst into tears and was beside herself with joy throughout their intimate dinner for two. Increasingly, hopeless romantics create surprises during wedding ceremonies, too. The bride thinks she’ll be walking down the aisle to a recording, and then she does a double take when she sees me playing live harp music for her entrance. 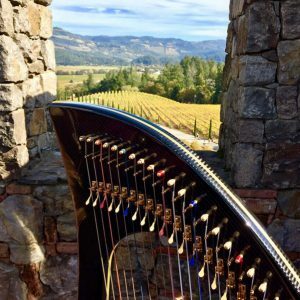 Harp music is a romantically convincing way to ask your favorite girl to the prom. Or maybe you feel romantic, like Bob, and wish to sprinkle a last-day-of-vacation with love. Music is an important ingredient to creating these romantic memories, because it has the power to touch the heart and be remembered for years to come. It’s one of the reasons why I love my job. Pair music with a surprise dance, and the romance tugs at everyone’s emotions in the room. I recently played an Irish jig as a surprise for the bride’s grandmother during a wedding reception, and the little ring bearer boys spontaneously jumped up to the dance floor while grandma applauded them. Here’s a great wedding video of how one groom surprised his Riverdancing bride at his reception. The look of surprise on her face is precious. My friend, expert choreographer and dance instructor Catherine Eardley, tells me touching stories of how she helps novice dancers get their groove on at weddings. Yes, I even play my harp for the first dance! Tagged as Anne Roos, download, harp music, romance, Unchained Melody. Sharon, what a sweet, touchingly romantic story! Thank you for sharing, and I’ll be happy to send along one of my harp CDs or album downloads for your efforts. Look for an email from me, or simply click “email Anne” in the upper righthand corner of this page. Thank you for the beautiful comment, Paul. Aren’t you doing exactly what you want as a singer, songwriter, and author?